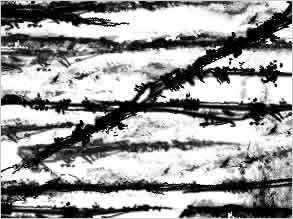 This set of photoshop brushes feature eight Grunge line brushes drawn again with a Wacom Tablet and pen. The image on the left shows a quickly created image, some of the photoshop brushes have been rotated, as quite allot of the images are quite long and face upwards. Its quite a dirty set, good for creating rough edges on photos and artwork. If you do need to rotate the brushes this Photoshop Tutorial might help solve some problems when working with small canvas sizes. Also check out the main Photoshop Grunge Brushes page for more sets of dirty grunge style brushes.